“It is not so difficult to be self-empowered,” argues Angela Kung’u, the Loans Officer of DOVE Springs SACCO*. She explained that women are among those being encouraged to join saving-and-credit groups. Angela noted that a Savings and Credit Cooperative (SACCO) helps people develop a ‘saving culture’ and save on monthly basis. Saving enables people, and especially women, to raise their living standards and that of their families. According to Angela, SACCOs are beneficial in that they bring services closer to the people. Average income earners are able to acquire assets for their homes or establish self-supporting businesses, and pay the loans slowly with a very minimal interest rate. Submission of monthly deposits and loan repayment is done through a cell-phone-driven banking system known as Paybill. “The new technology makes it easy for people to save from any region within the country,” Angela explains. Joab Onditi, Marketing Officer, noted that the SACCO has an economic impact on its members through loans that they have acquired. “We urge members to continue saving and take loans for their economic welfare,” he advised. Joab noted that the loans offered by the SACCO have the very low interest rates compared to banks and other financial institutions. He also added that it is easier and faster to acquire a loan, usually processed within few days, compared with the long process in banks. Many of the loans are relatively small, but have a huge impact in changing the economic landscape for small businesses and families alike. *DOVE SPRINGS SACCO is a project of Springs of Africa. 2015 was a year of multiplication for DOVE Springs SACCO (Savings and Credit Cooperative). Membership nearly doubled in just one year, with 104 new members added to bring the total to 214. DOVE Springs SACCO, a combined effort of Springs of Africa and DOVE Africa, aims to enhance economic stability, prosperity and quality of life through providing efficient investment and credit opportunities for its members. The society seeks out ways to build successful models of cooperative economic empowerment. In addition to teaching members on the importance of saving, the society encourages members to take low-interest loans that can be used for income-generating pursuits. Members have the added advantage of reaping dividends when the society realizes a suplus. Becoming financially stable is a major need and also great challenge for many families in the African context. DOVE Springs Sacco operates not only in Kenya, but has also extended to Uganda and Congo – within the DOVE network – to help empower those who participate in the program. Besides doubling membership in 2015, the number of loans given out to members also doubled. In total, Ksh 1.9 million ($19k) was released to members in loans in 2015, supported by the Ksh 2.35 million ($23.5k) that was collected from members’ contributions as well as additional donations from partners. All that results in a vibrant and growing enterprise that holds great promise for the future. After what seemed like a slow start in 2012 and several difficult years, the sponsoring organizations are thrilled with this tremendous progress. The SACCO model is sustainable, the vision commendable, and the results in the economic status of members are very encouraging. In conclusion, DOVE Springs SACCO looks forward to a successful financial year ahead. A DOVE Springs Sacco* member has experienced great success in selling curio commodities. Theresa Akumu Mbeche, a widow for 11 years and a mother of four, has successfully operated a curio shop in Nairobi for one year after acquiring a loan from the Sacco to get started. Theresa’s shop is located in a guest house, Amani Gardens Inn, at Westlands, Nairobi. The curio shop stocks nicely made handbags, clutch bags, necklaces and earrings, tablemats made with beads, wooden and beaded key holders, among other products. Theresa said that she sells most of these items locally, though at times to international clients. She explained that she designs the bags and collaborates with a tailor who polishes the designs for her. Through the sales, she makes a reasonable profit through which she can sustain herself and pay rent and school fees for her youngest daughter who is still in school. Theresa, who is faithfully paying her loan, gratefully praised the Sacco in that she was able to acquire a loan after saving for a few months. Theresa added that it advantageous to be a member of Sacco in that one only needs to save a little amount and through the little savings, he or she can acquire a loan and pay in less stressful way. As an advice to young entrepreneurs, Theresa urged them to be patient and fully concentrate with their business. She urged them to be aggressive in search of market and ensure they give their clients quality products. In the next one year, Theresa hopes that she will be able to expand her curio business and acquire a larger space for her shop. She looks forward to getting more clients, even internationally, for her products. 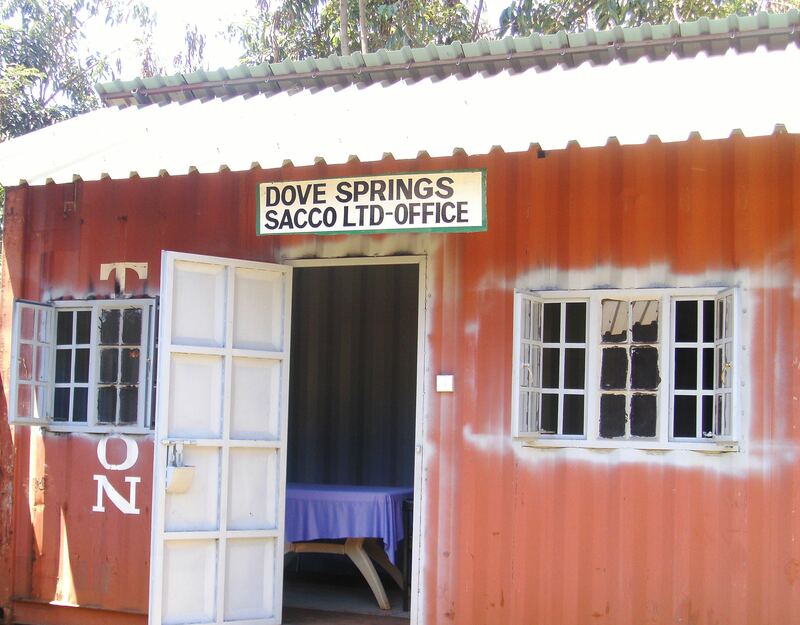 *DOVE Springs Sacco is a project of Springs of Africa empowerment initiative. Partnership is key in development work. This was quite obvious on my visit to the semi-arid region of northeastern Kenya, where the sight of sand dunes, acacia trees and camels provide an indication that life is hard. Tough weather conditions – drought and sweltering heat – are not the only challenges. Insecurity in the region has discouraged even those with best intentions. After militants attacked a nearby University earlier this year, many development workers including teachers and medics vacated the area. Springs of Africa partners are staying on, steadfast in their desire to bring hope and help to this region. Springs of Africa is honored to be partnering with DOVE Africa, and in turn with an entire network of partners, toward this end. Through this network, we have not only pooled resources together but also skills and expertise that support the work. Papaya in one of the farms in Garissa. health and agricultural sectors. Together, we are farming in this formidable area using pumped water from River Tana. The 10-acre farm has a variety of vegetables including kale, spinach, kunde and managu, and a young orchard. Although farming is part of the history of several local tribes, most have abandoned farming due to the harsh conditions and opt to keep livestock and burn charcoal. But in most cases, they rely on relief food – which may or may not come! 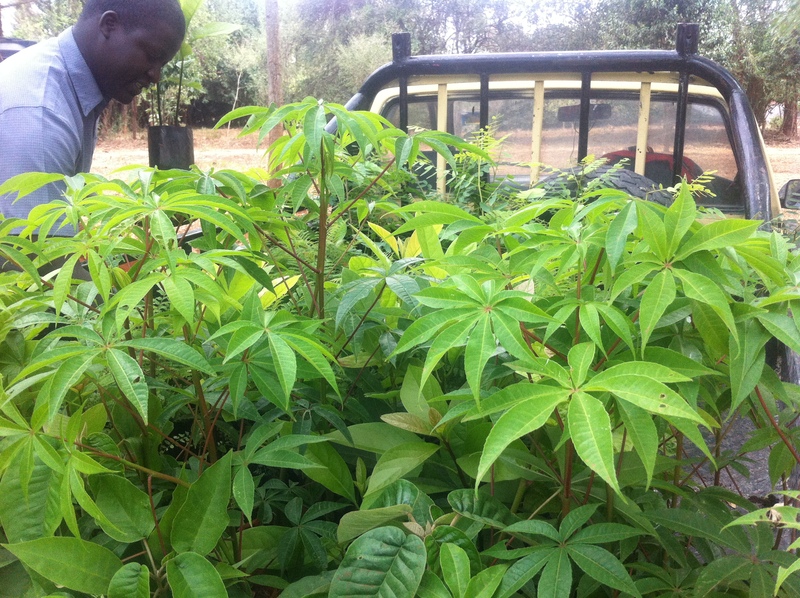 The farm project, therefore, exists to encourage local residents to produce their own crops. A clinic, open every Thursday, provides health services to surrounding villages and the nomadic tribes of the region. On every clinic day, more than 100 patients receive free medical care including medicines. At the same site, piped purified water and solar electricity are in place. Community members are given a chance to charge their cell phones at a subsidized fee of 10 shilling (one cent). That is quite an attraction! In addition to farms and a clinic, Springs of Africa has collaborated with DOVE and a church in South Africa to establish Ziwani Academy, a school for children in the village. An experienced school administrator from yet another church in the region has volunteered not only to teach, but to give administrative advice and help teachers effectively partner with parents for their children’s success. Previously, education was seen as unnecessary and unimportant by most parents in these nomadic tribes. That is not all. Women empowerment groups, in which DOVE collaborates with yet another local ministry, is reaching out to women. A team, through Joyful Women Organization, visits different women groups every week where they educate women and empower them financially through savings and table banking. We are grateful for all of these courageous and committed partners and trust that God will continue giving strategic connections – powerful partnerships – toward significant and holistic change. Schools in the Springs of Africa Education Initiative have received a unique boost in the form of children’s workbooks and teacher training. For the third time this year, teachers from Ziwani Academy in Garissa and Seed Academy in Kitale had the opportunity to come to Nairobi for the 2-day interactive sessions. They were empowered with various approaches for effective teaching of children in the Early Childhood level. 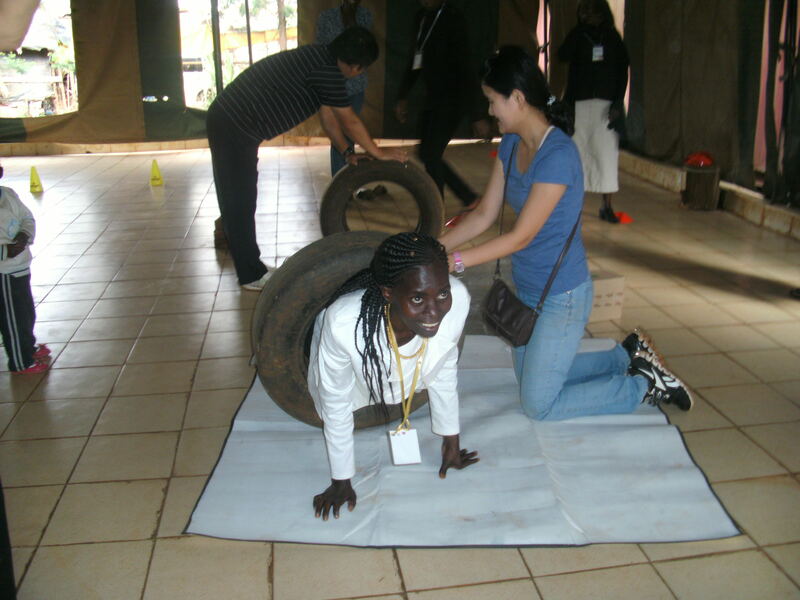 Teacher Martha Onyango from Ziwani Academy play a game during the teachers training. Looking on is one of the trainers, Sarah Lee. The training was full of humor as teachers pretended to be small children and jumped, hopped and sang their way through the course. They undertook numerous exercises and games, which they were encouraged to teach their pupils in their respective schools. Grace Mulwa, Headmistress of Ziwani Academy, appreciated the sponsors of the training. She said that the workshop was helpful as Mrs. Lee and daughter Sarah, the trainers, introduced them to interesting, interactive and very informative modes of teaching young children. The workshop was climaxed by the issuing of certificates to all the participants and the donation of necessary materials. Donations through Springs of Africa helped provide sponsorship for the teacher’s transport and accommodation. Thank you! 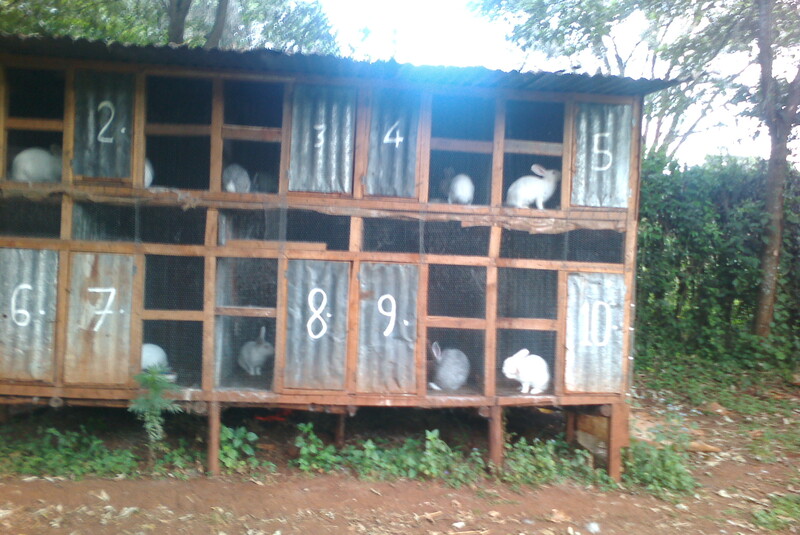 There is a new wave in Kenya, rural or urban-that of rabbit keeping. And the youth in DOVE have not been left behind! In November last year, an idea came to Daniel’s mind and he did his research about rabbits. This materialized to a rabbit keeping project which they, he and Jesse, are now undertaking in partnership. Rabbit Republic is a company that works with rabbit breeders. 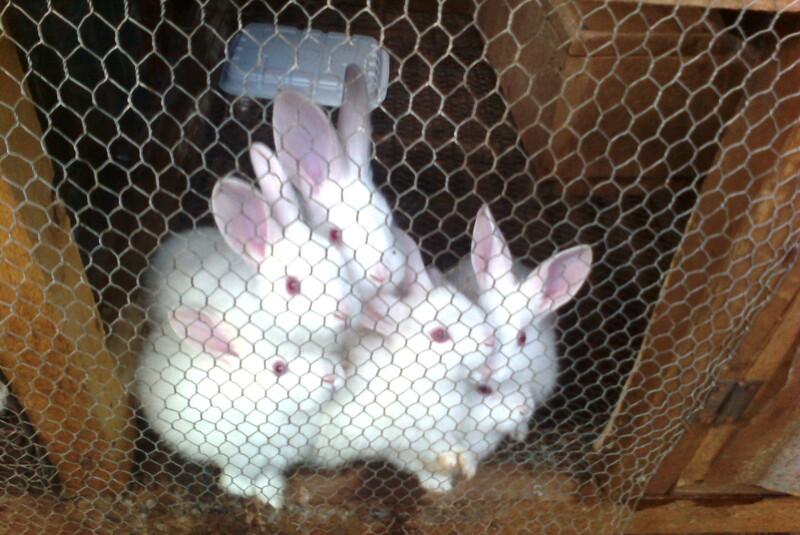 It trains the interested persons, sells the rabbits to start them off and later buys the kindles when they have bred a good number. With a loan from Springs of Africa, these ambitious young men started the project in May this year. It has been a good venture so far and they look forward to expand it in the future. Rabbits generally are an easy job; they do not require much attention. Their food consumption is very low and so do not need constant feeding. As thriving as the business may be, it requires keen and deliberate care for these animals. It’s evident to note the cleanliness of a rabbit’s fur, spotless! So rabbits call for high levels of hygiene and well-ventilated housing. Rabbits are really fragile, Jesse exclaims. At the onset due to the change of the environment, they lost 5 of the animals. And like every other animal, their young ones are very delicate and are especially affected by cold weather. Starting with 19 rabbits, they now have 17adults and 23 kindles. Apart from their meat being edible, their excretions are used for manure, and urine for pesticide and fertilizer. It has been a journey of learning and an exciting experience, as was evident in Jesse’s enthusiastic narration. John Muhoma in his work place with a sample of a bag he’s made! After spending a short time at the tailoring shop of John Muhoma, his passion is very evident. 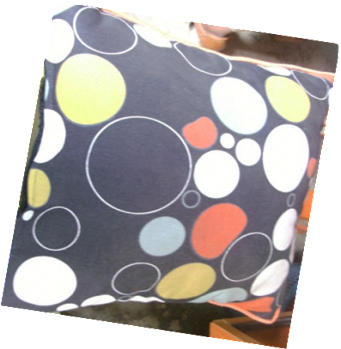 It is seen in the quality of his work – pillows, curtains, bags and more – beautifully crafted and sewn with skill. More than that, it is seen in the genuine enthusiasm used when he speaks about his tailoring shop: “Business is difficult, but worth it,” John declares. John was able to start his shop, a little over a year ago, with the help of a micro-finance loan of $250 through BDGF funds administered by Springs of Africa. With the small loan came big hopes for self-sufficiency and financial stability for himself and his family. Prior to starting this business, John had been employed on a temporary basis with several different companies but never managed to attain perm anent and pensionable terms of employment. Having his own business gives John and his family a new ray of hope. But small business doesn’t mean easy business. John shared struggles probably familiar to manynew business owners: there are times when business is slow and times when it is uncertain if the bottom line will be met. However, he perseveres, because business is an opportunity for a better life. He has been able to fully refund the loan, and is considering applying for another loan that could be used to purchase a more elaborate stock of supplies. During my visit, John shared pictures of a trip to Rwanda where his curtains were purchased for a church. He smiled and spoke with a great sense of pride. In that moment, it became clear: this “better life” is more than financial or monetary gain. It is the blessing of being able to do meaningful work and to contribute to the community around you.